Maybe this dish should be called Chinese Drunken Noodles, after all, it is more Chinese influenced that Thai, however it does have some of the Thai flavor profiles. Lately, I have been into making extremely easy dishes that are basically just a mix of lots of ingredients, and thrown together in a bowl at the end. It could be that I keep thinking of how awesome my Dan Dan Noodles were some time ago, and maybe that’s what led me to make these Drunken Noodles, or maybe it was the fact that I had to use up some of the Thai basil I had purchased one morning at the farmer’s market. Whatever the case, I am sure glad I made this recipe. Thai Drunken Noodles is basically a noodle dish that incorporates an awesome sauce consisting of fish sauce, soy sauce, and some garlic chili, among other things. Meat, or no meat can be used as well. As Thai drunken noodles commonly use a broader noodle, maybe something in line of a chow fun, I decided to make mine using a simple fettucine pasta. Start by seasoning our chicken. Add the salt and white pepper to the chicken. Mix well, and set aside. During this time, heat the oil in a large skillet over medium-high heat. Add in the chicken, and begin cooking it until it changes color, about 7 minutes. Once the water is boiling, add in your pasta, give a good stir, and cook just until under al dente. Drain. Next, add the fish sauce, hoisin sauce, garlic chili sauce, honey, and stock to a small mixing bowl, and do just that. Mix. Pour the chicken onto a large plate, then toss in the garlic, serrano chili, bell pepper, and onion. Cook for a few minutes, then add the chicken back into the skillet. Give it a nice flip or two. Add in the drained pasta, basil, as well as the sauce. Give a nice stir, or a few more good tosses. Cook for another few minutes, or until the chicken is no longer pink. 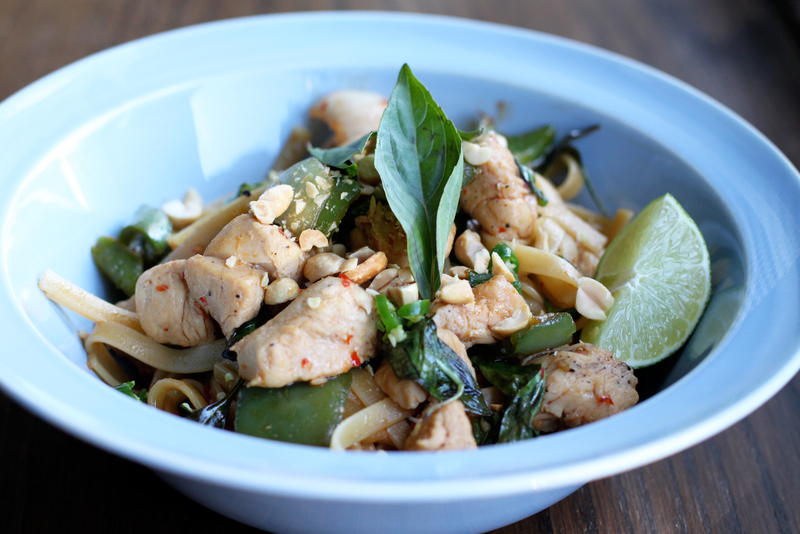 When you are ready to plate, simply place in a bowl, topped with fresh basil leaves, chopped peanuts, and some lime. Dig in. The flavors and comfort you get out of this dish is awesome. You get that comfort from what you think of is great Chinese noodles, but then are awakened by those lovely Thai flavors. This dish is a great all-in-one and is warming any day of the week. Hope you enjoy. A simple throw together noodle dish with chicken. Awesome recipe…thanks for the share !! This recipe looks amazing – so simple, so fresh! Thank you for sharing!